Guild Mortgage is a fast-growing independent mortgage lender. It’s America’s 19th-largest mortgage lender with total loan value of $12,206,391,000 in 2015, according to Consumer Finance Protection Bureau (CFPB) data. The company offers a wide range of mortgage products and has over 250 branch and satellite offices in 25 states. In spring 2017, the company introduced MyMortgage, a digital application to help homebuyers have a great customer experience. The paperless loan application streamlines the process and facilitates communication. Guild strongly supports an entrepreneurial spirit, and has grown and changed through its years of operation. Guild Mortgage was founded in 1960 in San Diego and its headquarters are still there today. The company now has more than 3,800 employees. Does Guild Mortgage Operate in My Area? Guild is licensed in every state except New Jersey and New York. You can find a local branch location in the following 25 states: Alabama, Alaska, Arizona, Arkansas, California, Colorado, Florida, Georgia, Hawaii, Idaho, Louisiana, Missouri, Montana, Nebraska, Nevada, New Mexico, North Carolina, Oklahoma, Oregon, South Carolina, Tennessee, Texas, Utah, Washington and Wyoming. What Kind of Mortgage Can I Get With Guild Mortgage? Guild Mortgage prides itself on the wide range of residential mortgage products it offers. The company has experience in several specialized loan programs. Fixed-rate mortgage: With a fixed-rate mortgage, you lock in your mortgage interest rate for the life of the loan. Your principal and interest payment won’t change throughout the course of your term. Guild offers terms ranging from 10 to 30 years. Single family loans can go up to the conforming amount ($424,100 as of 2017) and down payments can be as low as 3%, depending on financial factors and specialized programs. This type of loan can be best for those planning to keep the home for a long period of time. Adjustable-rate mortgage: Unlike fixed-rate loans, your interest rate will change in one-year periods following the initial term with adjustable-rate mortgages (ARMs). Guild recommends these mortgages for homebuyers planning to move or refinance in five - 10 years. The company offers ARM loans with three-, five-, seven- or 10-year initial fixed-rate periods. After the agreed time period is up, the mortgage rate will change. This type of loan has the lowest interest rates initially. Guild requires a minimum FICO score of 640 to qualify. Jumbo loan: For home purchases over $424,100 (in most areas), Guild offers fixed-rate or adjustable-rate jumbo loans. Guild advises that only borrowers with excellent credit and strong assets consider this type of loan. Jumbo loans are considered non-conforming loans and exceed Fannie Mae and Freddie Mac guarantee amounts. This means Guild Mortgage has to secure the loan itself, which means stricter requirements for borrower finances. Federal Housing Administration (FHA) loan: As a government-backed loan, FHA loans are available to many first-time homebuyers and people with low-to-moderate incomes. Down payments can be as low as 3.5% with this type of loan. FHA loans do come with some government requirements, such as mortgage insurance. This type of loan is available as a fixed-rate or adjustable-rate mortgage. If you have limited funds, a low income and a lower credit score, this may be the mortgage option available for you. USDA loan: The U.S. Department of Agriculture (USDA) backs this type of loan for borrowers in rural or underdeveloped areas. You may be eligible for a USDA loan if the property is in a designated rural area and your household has a low or moderate income. Features of this type of loan include zero down payment options as well as lower rates and fees than other loan programs. VA loans: This loan is designed for current or former member of the U.S. Armed Forces, National Guard, Reserves and select spouses. As a government-backed mortgage, this loan comes with some advantages including zero down payment options and lower rates than other programs. Guild 1% Down loans: This unique down payment assistance program allows borrowers to pay just 1% down. Guild will cover 2% and you can get a mortgage with a total of 3% down. You don’t have to pay back Guild, the 2% is yours free with the loan. You’ll need a minimum FICO credit score of 680 to qualify and the program is not just for first-time homebuyers. However, a homeownership education course is required for this option. In addition, you will need mortgage insurance with this loan as it’s below the recommended 20% down payment, but it is cancellable and reduced with this program. Refinance: If you’re hoping to refinance your mortgage for a lower interest rate or new mortgage term, Guild Mortgage offers refinances. Guild does not offer as much information regarding refinance options on its website as it does for other mortgage options, so you’ll have to contact a loan officer to discuss your situation. What Can You Do Online With Guild Mortgage? First-time homebuyers can get started by using Guild’s online educational resources that cover topics such as mortgage basics and what information is needed for a loan application for new homeowners. Each type of loan, such as adjustable rate, jumbo or FHA, has a brief explanation and guide to who’d be the best fit for the product. Some loan types include a minimum FICO credit score as well, so you can get an idea of what may be the best product for you. Unfortunately, you won’t find current loan interest rates on Guild’s website. You’ll have to start an application or speak with a loan officer to find out what terms are being offered. Once you’re ready to start a loan application, you can create an account using just your name, email and branch location. After you log into your account, you’ll go through the application steps. Guild saves your information as you go along, so if you need to stop at any point you can without losing your progress. Once you’re ready to submit and your application is complete, you can do so online granted you have all the necessary financial information on hand. Luckily, Guild offers a list of what you’ll need to apply so that you can gather the information prior to starting. One thing lacking from Guild’s online experience is a quick option to prequalify online. There is a section under the first-time homebuyer page on the site that will walk you through the reasons why pre-qualification is important, but it’s not offered online. At the bottom of the page you’re prompted to talk to a loan officer if you want to discuss pre-qualification. Once you have a mortgage through the company, you can register for what’s called “My Account.” This free online service allows you to make payments online and download loan statements. If you already signed up for an account to apply for a loan online, you don’t have to sign up again. Your account will be ready to go once the mortgage is approved. Would You Qualify for a Guild Mortgage? Qualifying for a mortgage depends on a number of factors. Guild Mortgage lists recommended credit scores for some of its loan offerings. This includes an “adequate” score for fixed-rate loans, a minimum 640 FICO score for ARM loans, 620 for conforming (Fannie Mae and Freddie Mac) and a minimum 680 for the Guild 1% down loan. VA, USDA, FHA and jumbo loans don’t have specified minimums, but a higher score is ideal for any mortgage. It’s the best way to get the lowest interest rates and most generous loan terms. Many lenders recommend that you improve your credit score prior to applying for a mortgage. The next factor to consider is your employment history. Generally lenders need to see at least two years’ worth of employment proof such as W-2s and payroll documents. This helps the lender understand how you’ll afford mortgage payments. After income, your savings will be analyzed including how much you plan to use as a down payment. Conventional loans usually require 20% down. Guild does have its 1% down loan, however, it’s aimed at those who’re struggling to pay the down payment. If you do choose to buy a home without having 20% down, you most likely will have to pay mortgage insurance. This is separate from homeowners insurance, which is also required. Mortgage insurance helps guarantee that the loan will be repaid even if you default on it. Your debt-to-income ratio will also play a large factor in whether you’re approved for a loan. The general guidelines state that 45% is the absolute maximum (usually with FHA loans), but usually lenders like to see numbers closer to 30%. To calculate your debt-to-income ratio, first total your monthly debt. This includes car payments, student loans, other existing mortgages and credit card debt. Next, find your monthly gross income (pre-tax). Take your total debt, divide by your income and then multiple by 100 to find your ratio. The lower your ratio the better your chances at qualifying for a mortgage with low interest rates. The higher your ratio, the harder it may be to qualify as you may exceed your ability to make payments. What’s the Process for Getting a Mortgage With Guild Mortgage? 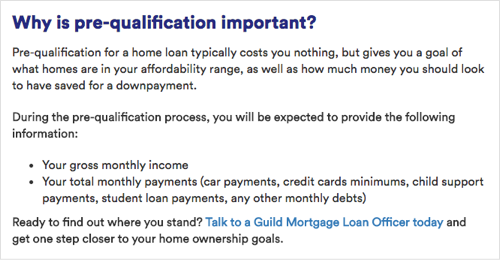 You have a few options for applying for a mortgage with Guild. If you’d like to complete the process in person, you can find the closest branch using the site locator. You can always call as well, and speak to a representative. And if you’d like to get started online, you can do that, too. For the application itself, you’ll need a variety of personal and financial information. You can find a list of documents on Guild’s page dedicated to what you need for your loan application. Required information can include your and your co-borrower’s (if you have one) Social Security number, W-2s, tax returns, bank account numbers and addresses. If you were a student or are self-employed, you’ll need to provide things like transcripts and profit and loss statements. Your loan officer can walk you through what you’ll need if you’d like a personal touch. If not, the online application has step-by-step instructions so you can input your financial information on your own. Once your information is analyzed and you’ve provided everything that the loan officer requests, you’ll find out if you’re approved or not. If you’re approved, you’ll coordinate a closing date. The closing process usually requires a few additional items such as a homeowners insurance policy and a check for closing costs. At the closing itself, you’ll review and sign a large amount of documents. 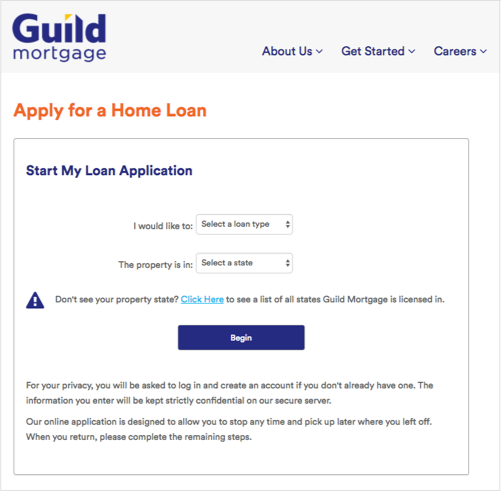 Guild Mortgage doesn’t offer much content on its site regarding the closing process, so you may want to discuss it with your loan officer to find out more. While Guild Mortgage is growing fast, it’s still only offered in limited areas. Guild itself has branches in 25 out of 50 states, and originates loans in 48 out of 50 states. The company partners with local loan officers to up its availability to 250 locations, but that doesn’t compare to lenders such as Wells Fargo, Caliber or Quicken Loans, which originate loans in all 50 states. You also don’t have the option for any services other than mortgage with Guild. If you like using the same financial institution for banking as well as loans, that’s not an option with this mortgage-only lender. The good news is that you can apply online for a loan, which isn’t the case with all lenders. However, as more and more lending companies offer this service, it’s less of a defining factor than the norm. Guild also doesn’t have a mobile app or the option to prequalify online. So far, it seems that you can only complete a mortgage application and the later track payments and mortgage history through the site. A small ding to add is that Guild doesn’t offer current mortgage interest rates on the site. While those numbers do change, other lenders offer that information online. It helps a borrower get a better idea of what potential monthly payments will look like.